Discover the highlights of four different Australian cities as you travel down the East Coast in style on this cruise & rail journey. Tour through the picturesque mountain retreat of Kuranda village surrounded by World Heritage-listed rainforest. Discover the charm of rail travel aboard the Indian Pacific & Spirit of Queensland. Immerse yourself in the surrounds of the sub-tropical rainforest of the Green Mountains. Relax aboard Sea Princess as she carries you down the East Coast. Enjoy delicious food & wine in the world-famous Barossa Valley. Transfer from the rail terminal to your accommodation including a half day Brisbane City Sights tour. 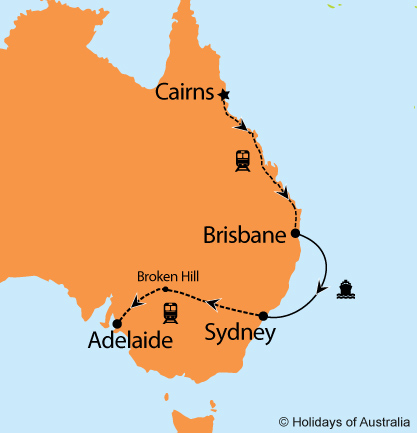 2 nights aboard the Sea Princess from Brisbane to Sydney. Your cruise includes on board meals and entertainment. 1 night aboard the Indian Pacific travelling from Sydney to Adelaide in Gold or Platinum Service. Your journey includes all meals, drinks and off train experiences in Broken Hill. 3 night stay in Adelaide at the Holiday Inn Express Adelaide City Centre including breakfast. Images courtesy of Great Southern Rail, Princess Cruises, Tourism & Events QLD, Brad Newton, Tourism SA.